The Chocolate Cult: Chocolat Frey Party Time! 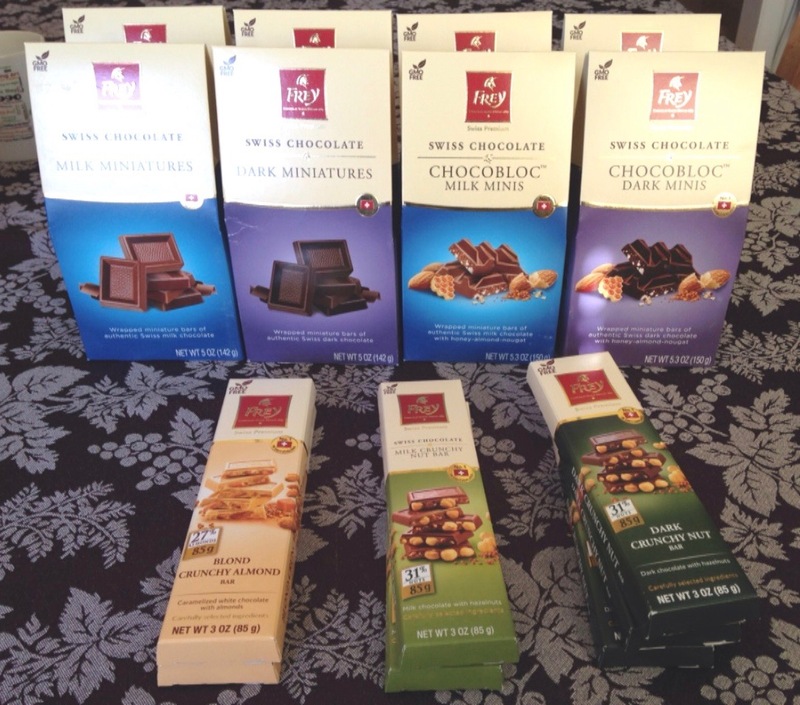 Once more via the Tryazon program, The Chocolate Cult had the opportunity to host another chocolate tasting party. 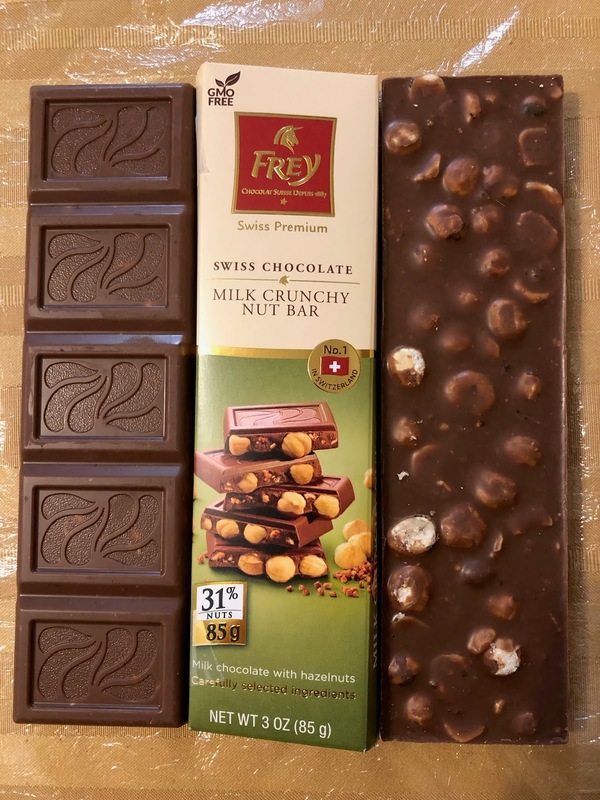 This time we teamed up with Chocolat Frey, an European company that makes Swiss chocolate lines as well as other products. You should be able to find it in grocery and drug stores in the USA such as Kroger,Walgreens, Food Lion, Meijer, Shaw's, Shoprite, and Wegmans. Let me know if you have seen this brand in any of those shops in your area. 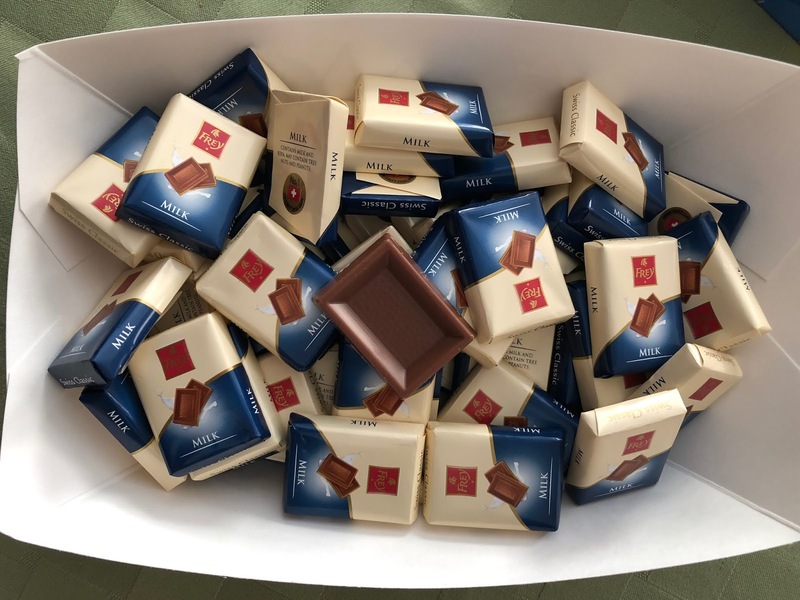 We received 7 bars (1 extra than we were supposed to get so I hope another blogger wasn't shorted) and 6 bags of chocolate in 7 varieties of their bars, miniatures, and milk chocolate. 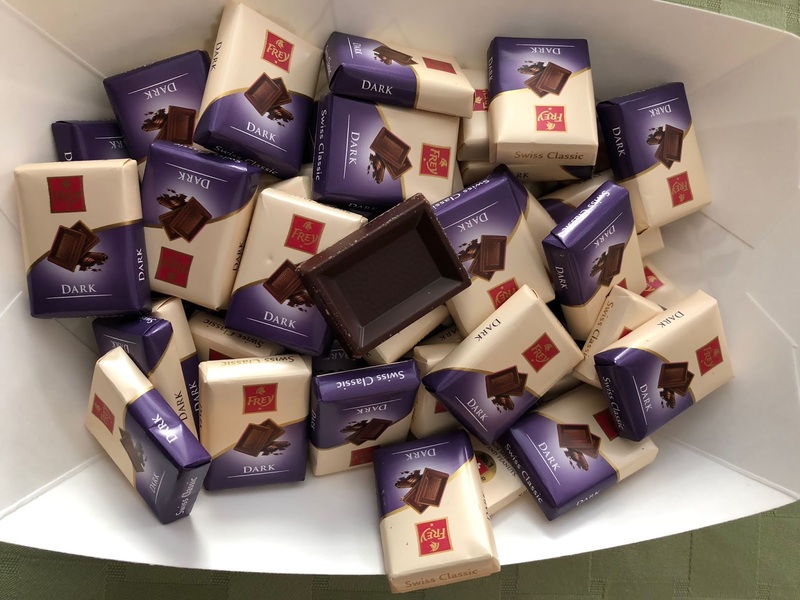 I got together a group of friends to try all of these out and share their opinions with me, with you the reader, and with Chocolat Frey via Tryazon. Chocolat Frey sent me all these products for free in exchange for hosting a tasting party, blogging about it, and reporting back; no other form of compensation was received for our honest sharing about our experiences with these products. I threw my party on Saturday, February 9, from 4-5pm. After consulting with 15 who have helped me with my tastings or product testing in the past, I picked a date and time that seemed to work for most folks and invited 10 hoping I'd get to the five (not including me) that I needed for the party. Just less than four hours before the party one couple pulled out because of sickness. 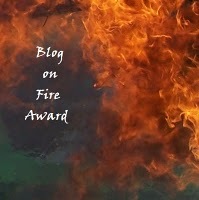 I put out a final reminder for the party on the FB invitation. While I'm grateful for the chance to try out new to us brands of chocolate these parties are stressful and I'm not paid to do them. Tryazon, you might want to think about that in the future! I had a total of 5 friends (thank you surprise guest!) there to help me taste everything. We started with the basics and lower cacao content and worked out way up to the most ingredients in the dark chocolate during the party. I had all the guests sit around the table and I brought out one flavor at a time, showing off the wrappers and asking them to note their opinions on the back of a piece of paper as well as in conversation. The paper had some facts about the brand on them that I pulled from information I was sent. 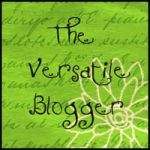 I'd already shared a video in the invitation. 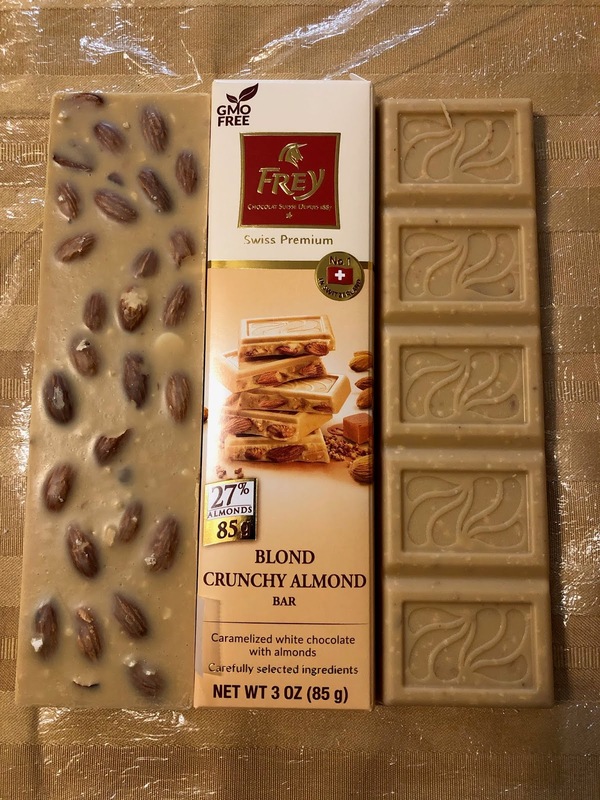 I had broken up the three types of bars ahead of time and unwrapped at least one sample from the other 4 varieties to shot the photos you'll see below. I'm going to summarize the collection opinions of the six of us. We were surprising in accord and we discussed sample for 5+ minutes after trying each. We cleansed our palates after each sample so there was no cross contamination. We began with the Milk Miniatures that came individually wrapped. 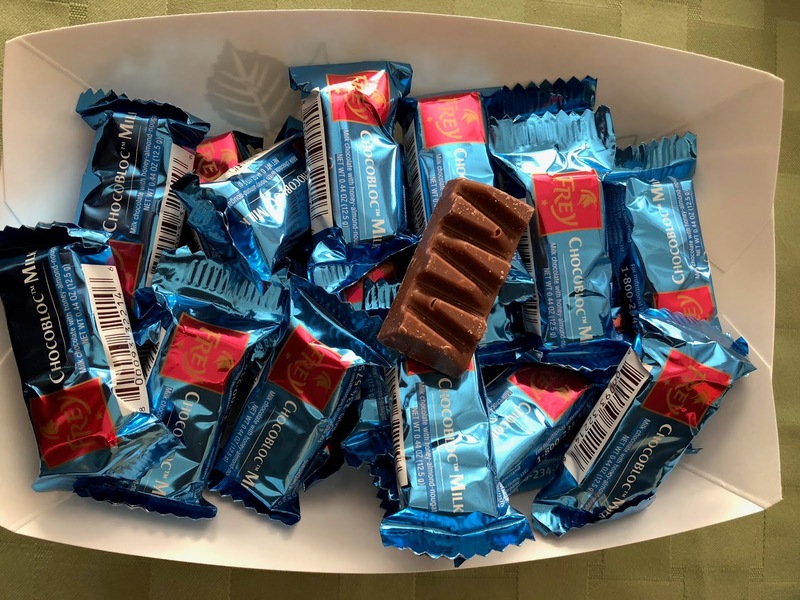 The milk chocolates has this blue color on on this box and on the milk chocolate chocobloc as well as you'll see below. This was definitely in the spirit of Swiss chocolate -- creamy, sweet, lots of vanilla flavor. In fact, every single person tasting this was overwhelmed by one of those facets of the pieces but none of us felt the chocolate was strong enough. The first ingredient on the list for this was sugar so more on the candy side than the pure chocolate side though there are no added oils. Then we tasted the Dark Miniatures and we could see and smell that it was darker. How much darker? My guests asked because with the exception of the surprise guest, they'd all done tasting either in previous parties or one-on-one testing with me in the past. We have no idea, that information was not on the package. You can see in the photo that the color for dark chocolate is purple. This had a wonderful taste and it was the overall WINNER for the tasting party by a vote of 6 to 0! It was smooth, it was just sweet enough to take the edge off of the darkness, and we could get the different tones of the chocolate by letting a bite melt on our tongues or build up with each chew. 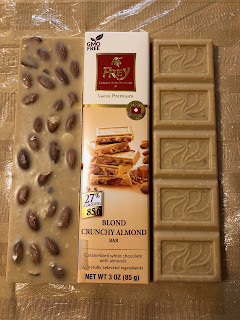 The Blonde Crunchy Nut Bars were next as we stepped up to the Crunchy Nut Bar line from Chocolat Frey. The white chocolate is caramelized and that added a tangy edge to what most of us consider to be a flaw in white chocolate -- overwhelming sweetness. As you can see the color is indeed "blonde" and the almonds in it were whole. 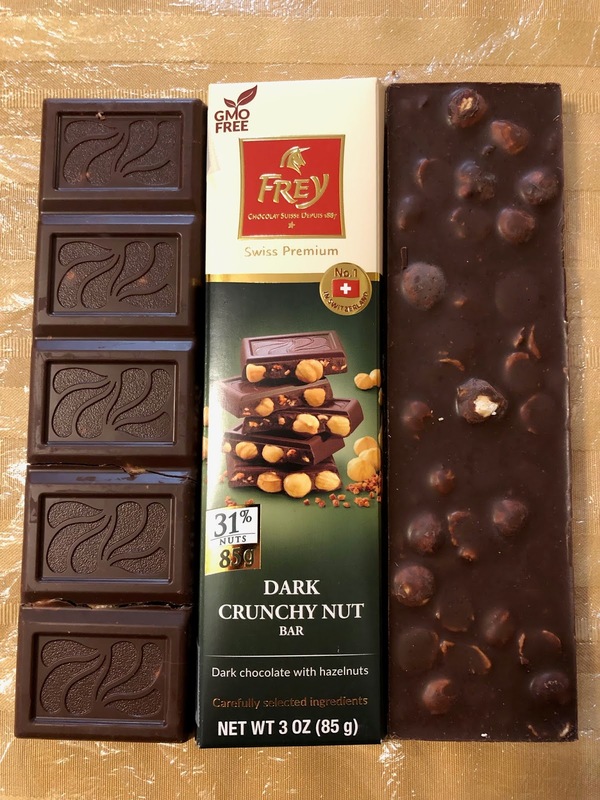 The nuts were all crispy and crunchy, the chocolate surrounding them was a wonderful counter to the almond flavor which can be very strong in many chocolates. Our Mocha and Alcohol Acolyte normally prefers darker chocolate but this was her second favorite of the 7 types we tested. She took the leftovers when everyone else agreed to let her because she loved it so much. Not a single tester disliked it but some of us still prefered other bars before this one. Milk Chocolate Crunchy Nut Bars marked the midpoint of our tasting. For some reason the blue is gone and has been replaced by this green... A consistent branding coloration would be easier for the consumer. This time instead of almonds we had hazelnuts and they were both entire nuts as well as smaller pieces. The nuts were crispy and crunchy but this was the same milk chocolate we didn't like before and we didn't really like it here though it tasted less sweet this time around probably because of the hazelnut flavor. Sadly it wasn't enough to save it for anyone in the tasting group and no one wanted the extra pieces. Dark Chocolate Crunchy Nut Bars finished off the Crunchy Nut Bars testing for us all. In this case, the darker chocolate was a wonderful companion to the hazelnuts, the two flavors balanced well. Since hazelnut can be overdone and can overpower chocolate (see the milk version) this was a wonderful surprise. This was the same dark chocolate that we all love previously and while we didn't like this as much as the chocolate on its own, it was the second favorite for 5 of the 6 of us. 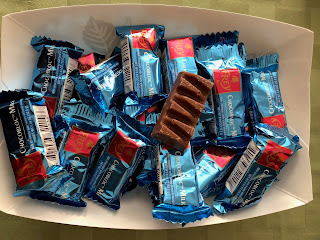 We tried the Chocobloc Milk Minis next because this had almonds as well as honey nougat. These were individually wrapped again with a blue on the wrapper as with the minis. As you can see, these were a thick block but there is a triangular pattern along the top half of the piece. The honey was really strong in this from the first bite and it build up with each chew. Between then and the Crunchy bar we liked this better but still the milk chocolate was a disappointment. 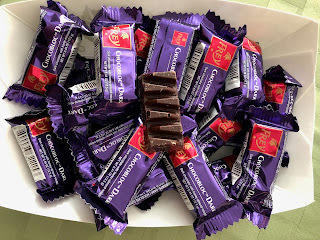 Finally we tried the Chocobloc Dark Minis pieces that were wrapped in purple with the bring red logo. 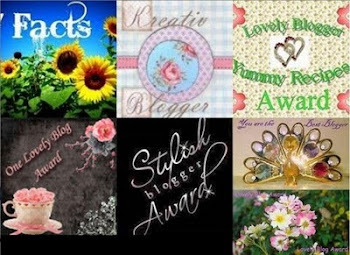 One tester commented that the chocobloc wrappers were beautiful and several agreed. This chocolate was darker but had the same shape as the previous. I appreciate when brands make consistent line forms and colors. With this the chocolate was the first, middle, and strongest flavor (like we want on The Chocolate Cult) and the honey built up slowly. The hazelnut blended in well with the chocolate. Delicious. Chocolat Frey's dark chocolate is good, on par with the better mass produced dark chocolates we've written about here. The blonde chocolate was a wonderful treat; the brand should do more with it. Their milk chocolate... We were not impressed. The six of us recommend you check out the blonde and dark chocolate varieties of Chocolat Frey.